meet the latest in the Beat Light Collection, available exclusively at Lumens. In the 10 years since it debuted, Tom Dixon’s Beat Light Collection has quickly become a signature piece, both for the British design studio and for modern design at large. Called an “exercise in expressive minimalism,” the design is at once bold and simple; clean and sculptural. But the Beat Light collection is as much about craft as it is aesthetics. Each Beat Light is created by renowned craftsmen in Northern India, a region where traditional brasswork was in need of a revival itself. Each fixture is crafted from a solid sheet of brass, imitating the proportions and techniques used to create cooking pots and water vessels. The interior markings are unique, and a testament to the hand spinning, braising and beating that goes into each one (a single light can even take up to 4 days to craft). This year, Tom Dixon has added two new shapes to the Beat Light Family: Beat Waist and Beat Flat. 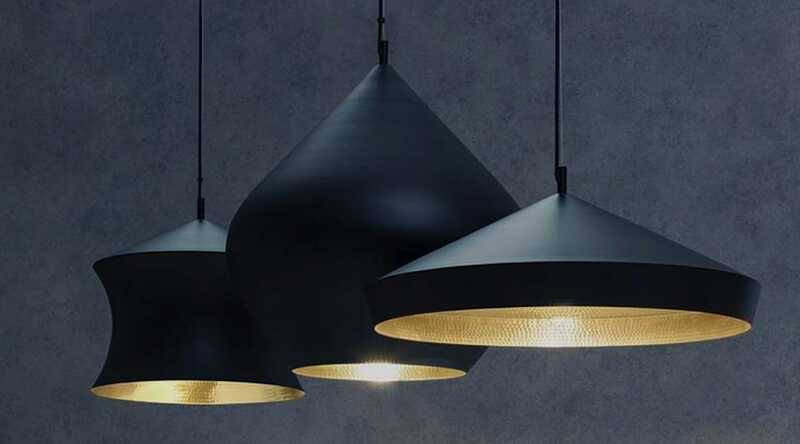 The idea behind the Beat revival was threefold: fresh silhouettes, to create greater light output and offer more architectural-scale lighting from the collection. Many of your lighting designs have taken on new forms, variations and iterations from where they began—such as the new additions to the Beat Collection. Do you think of most pieces in terms of a collection, or does it begin with a single piece? Each light has its own story and exists in its own dynamic, but I quite like tinkering with things, upgrading and evolving collections. I get quite bored, you see. Is there a piece or collection from your design career that stands out as your favorite? The one I haven’t created yet? What are you most excited to work on in the upcoming year? Ha! Top secret! But we are doing more interior design projects, more categories in goods and more collaborations with exiting friends. More in our Behind the Design series: Tom Dixon’s Plane Collection.